Some leaf succulents are very small. This picture above shows two Lithops plants. Lithops literally means stone face – the little plant bodies look like stones. They come from dry areas in the southern parts of Africa and in the wild they mimic the stones around them making them very difficult to find. Each plant body consists of two succulent leaves which are joined together. Each year the Lithops grows a new pair of leaves. The old leaves become dried up, and eventually split open, showing the new ones underneath. You can see the remains of the old leaves at the bottom of these plants. Sometimes two pairs of leaves will appear where there was only one before and they may grow into large clumps. The daisy like flowers appear from between the two leaves. 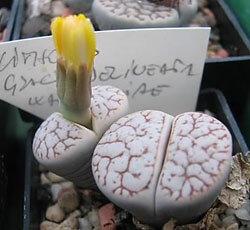 Many garden centres have Lithops for sale, and they are easy to grow. But they do need special cultivation. Do not water them until the old leaves have completely dried up, usually about June. Carry on watering them until the end of October and then stop completely until next June.